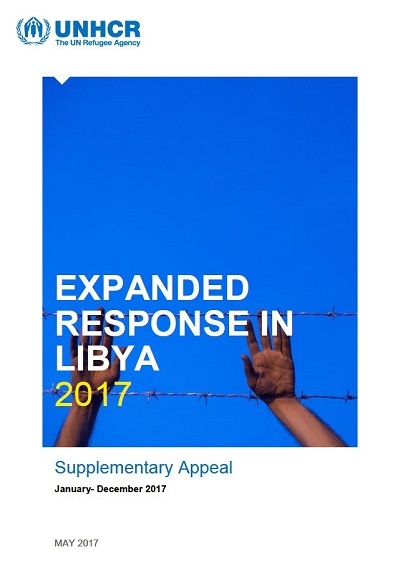 This Supplementary Appeal outlines UNHCR’s expansion plans for the operation in Libya and presents funding requirements to meet the increased humanitarian and protection needs of conflict affected populations, both Libyan and non-Libyan. In line with its Protection Strategy for Libya, UNHCR’s objective is to enhance and expand the protection response to refugees, asylum-seekers, internally displaced persons (IDPs) and returnees, through facilitating solutions to displacement and increasing the level and quality of assistance provided to civilians affected by the conflict. Key protection activities will include protection monitoring and interventions as well as advocacy on issues related to respect for human rights, access to basic services and asylum procedures, and freedom of movement. UNHCR will also work towards building the capacities of Libyan actors in these areas. Civilians in Libya continue to suffer as a result of conflict, insecurity, political instability and a collapsing economy. The direct humanitarian impact has been that hundreds of thousands of people across the country are now suffering, living in unsafe conditions, with little or no access to life-saving health care, essential medicines, food, safe drinking water, shelter and education. A total of 1.3 million people are in urgent need of humanitarian assistance. The absence of functioning government institutions and a breakdown in law and order have provided fertile ground for the proliferation of criminal networks in Libya, including international smuggling and trafficking operations. Migrants and refugees have become another commodity to be exploited for profit. Of the three main routes bringing refugees and migrants to Europe, the Central Mediterranean route currently represents the largest migration channel. Libya is by far the most important transit point for refugees and migrants aiming to reach Europe, with over 90 per cent of sea arrivals to Italy having departed from Libya. More than 180,000 people reached Italy by sea in 2016 - this is an increase of 18 per cent compared to same period in 2015 (153,842). As of mid-May 2017, 45,750 people reached Italy by sea, which also represents a 30 per cent increase from the same period last year. Furthermore, 2016 recorded an unprecedented increase of 109 per cent of sea arrivals of unaccompanied and separated children (25,846) compared to 2015 (12,360) and this trend is expected to continue in 2017.